The highly anticipated The Ultimate Fighter season 13 has finally arrived. If you were expecting to see fireworks between TUF coaches Brock Lesnar and Junior Dos Santos you are going to have to wait until UFC 131. Otherwise it was a fairly average show. Brock Lesnar isn’t there to play. Brock Lesnar had a snarl for most of the show. For a guy that understands sports entertainment it doesn’t appear Brock is going to go out of his way to sell his UFC 131 fight against Junior much this season. There weren’t any confrontations tonight nor were there any teased in the season preview. The TUF 13 coaches had time to evaluate the fighters before they picked. 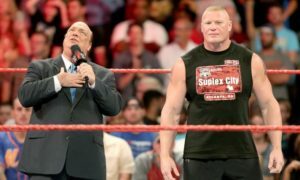 Brock Lesnar based his evaluation on the guys’ cardio while Junior appeared to base his on technique and had them working out in the octagon. I think that speaks volumes of what to expect out of Lesnar’s team. Even before the first fight it appeared Lesnar spent more time working on his fighter’s cardio as opposed to Santos who had his guy sparring. Dana White eliminated preliminary fights and put everyone in the house immediately. Thank God! I absolutely detest those preliminary fights. Most of these guys are inexperienced as it is. Put more than 12 in there and you have some of least skilled fights you will ever see in MMA. It is also boring. The last few season openers were nothing but fights with no personality. It killed my interest right off the bat in the last two seasons. I think that was a wise move and I hope they don’t return in future seasons. Both guys got the fighters they wanted with their first draft picks. Brock picked Len Bently who has a pro record of 9-4 with the first overall pick while Junior took Shamar Bailey who has a 10-3 record. I wouldn’t read that much into first draft picks. Bobby Southworth and Kimbo Slice were top draft picks while Roy Nelson and Forrest Griffin were late picks on their respective seasons. It should also be noted that the draft wasn’t live. Dana wound up coming into the room and reading off picks. Nobody seemed happy or disappointed with their teams. One of the fighters already left due to injury. Myles Jury who came into the show with a 9-0 record tore his ACL during the evaluations. Tough break as Jury was one of the strongest fighters on paper coming into this season. All of the fighters looked to be in great conditioning in the first episode. There is nothing that kills me more than seeing a kid getting the break of a lifetime show up to The Ultimate Fighter out of shape. Everyone looked good in the cardio and fight workouts which is a positive sign indeed. Junior got to make the first fight and he made Shamar Bailey vs. Nordin Asrih which was the first pick vs. the last pick. Bailey was just way too big for him and the two looked like they were in different weight classes. Bailey outwrestled him and just grounded and pounded Asrih for two rounds to win. For an opening fight, this one was very disappointing. Brock didn’t seem surprised by the result. Dana White after the fight also noted that the fight sucked which isn’t the ringing endorsement you hope to get from your potential employer. The Ultimate Fighter usually has a rowdy member or two of the bunch that try to walk in the shoes of Chris Leben. I didn’t find any of these fighters to be particularly undisciplined but there were a few clips of chaos during the season preview at the end of the show. For the most part most of the guys seemed to be level headed and focused on the task at hand. The biggest disappointment in the first episode was Brock Lesnar. I think a lot of people expected Brock to come into the show all crazy and loud when for the most part, Brock was pretty quiet. Brock and Junior have both been quite complimentary to one another in media interviews over the last week or two. The closest we got to any kind of madness was Brock offering a handshake to Junior after they made the first fight and Junior opting for a pat on the back instead. Not exactly what I’d call the makings of a great grudge match. If there is one danger here that I saw tonight it is that TUF may expose Brock Lesnar as an MMA fighter who isn’t particularly skilled. I have written about this before but tonight, Brock looked like he was way out of his league. The obvious differences in the way the coaches ran their training camps have the potential to make this a very one sided show. I can’t imagine how Brock Lesnar will handle this is if he is made to look like a fool by the end of the season. All in all if there was anything I took out of tonight’s episode and the season preview at the end, it is that this season is going to be rather tame. There was one clip of Brock calling his team out but that was it, just one clip of any controversy involving the former UFC heavyweight champion. There were a few skirmishes in the house shown in the preview but nothing of legendary proportion. By the time this season’s over I think fans will see a lot of fights, some good, some bad, and not much more. I just hope they get a little more exciting than the fight that closed the show tonight.